Plot: A man challenges himself to say “yes” to everything for an entire year. Tagline – One word can change everything. Story: Yes Man starts as we meet Carl (Carrey) a banker that doesn’t like to socialise with his friends, co-workers or seems to always say no to everything. when Carl bumps into an old friend Nick (Higgins) who has turned his life around by always saying ‘Yes’ to everything in life. Carl ends up joining the same group deciding to take the whole year just saying yes, in this time he meets Allison (Deschanel) a musician who is completely different to himself and gets closer to his best friend Peter (Cooper), one of the few people that still encourages him to go out, the question remains just how extreme everything will go. Characters – Carl lives a very restricted life, mostly because of his divorce and life not going any direction he is enjoying. This has made his friendship group dwindle down, after being encouraged to take the risk of the ‘Yes’ motivation group, he starts saying Yes to everything, from helping a homeless person to approving a bank loan to a stranger. Allison is the woman that Carl meets in the year after saying yes to something he never would, she is different to anything he would usually go for, being spontaneous on every opportunity. Peter is the best friend of Carl’s the one that will always try to push his friend to get out there and enjoy his life, he has been let down by Carl before and the friendship is what keeps them close together. Nick is the man that inspires Carl to follow through with the idea to say yes, he used to be like Carl and now he is enjoying his life. Performances – Jim Carrey in the leading role is good for the most part, the problem with this is that he lets too much of his slapstick comedy going on and this role would have bern fantastic for a straight-faced actor to pull off. Zooey Deschanel is good as the love interest, she always is great to see as the girlfriend and she gets to show her singing skills at times too. Bradley Cooper was continuing to make a name of himself in supporting roles where he once again gets his timing right. The supporting cast all get good laughs through the film. Story – The story follows a man who believes his life isn’t going well stuck in a rut which he is happy enough with, when he gets given a chance to take chances he starts saying yes to everything which opens up his life to new opportunities. This does show us the meaning of life even if we see the extremes of it here, we get to see how taking chances with make for an enjoyable life however mad certain parts might be. We do see moments of people who will take advantage of that person, which isn’t ever addressed enough especially when one is a close friend, overall this story shows us just how important living life is, taking chance because you never know what you might find in life. Comedy/Romance – The comedy in the film comes from the reactions and participation in the events that Carl get put through, we do get laughs from the supporting cast with Rhys Darby as Norman getting the most. The romance side of the film comes from taking a chance, Carl had been divorced and not wanting to take a chance on meeting new people which saying yes offers him. Settings – The film is set in LA which is fine, it could have been set in any city because none of what is achieved makes a different to the actual settings. Scene of the Movie – Close stage. That Moment That Annoyed Me – Carrey sometimes goes to slapstick too quickly. Final Thoughts – This is a fun motivational movie, sure it becomes a basic comedy and could have been better with somebody not known for comedy in the leading role, but it does everything it needs to. Plot: Two teens battle their way through a religious apocalypse on a mission to defeat the Antichrist. Story: We start by following our heroes standing over a hot tub explaining how they saved the world, before flashing us back to the very beginning and how half the world just vanished taken to heaven. This leaves the non-believers stuck living through the plagues before we meet the Beast the Anti-Christ himself, taking over the world making everyone do what he wants. When our young couple are looking for a job they end up getting one working for The Beast where he takes a shine to our young heroine and wants to make her his wife. The couple have to come up with a plan to stop The Beast’s plan. Support Cast: The supporting cast mainly end up being the attempted comedy be it the stoner demons or the dead neighbour. In the end they all just take up screen time the leads needed to evolve their characters. Best Part: The dead neighbour is the highlight. What Could Have Been Better? – Built the characters up more, make the characters ages more apparent, have better laughs. This list could be long. Lessons Learned: Craig Robinson is a supporting actor, Anna Kendrick can’t be a teenager anymore. The third movie in the Blade series and guess what? they ran out of original ideas for villains and went with Dracula well Drake (Dominic Purcell) is his official name. So basically the baddie vamps lead by Danica (Parker Posey) her brother Asher and their bodyguard figure Jarko Grimewood (Triple H). These guys decide to raise Drake to help take over the world blah blah blah. 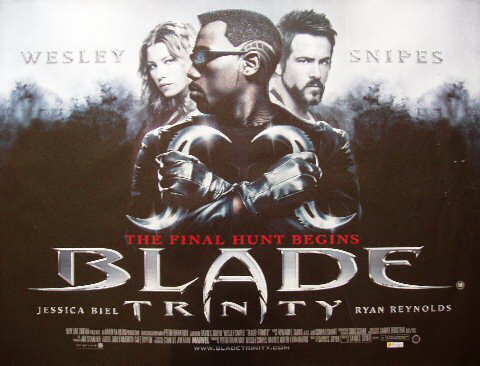 On the good guys side Blade (Wesley Snipes) has to deal with the death of Whistler ( Kris Kristofferson) when he is saved by Whistlers daughter Abigail (Jessica Biel) yes this is a major storyline plot hole but it gets explained as an unwed lock baby. she is aided by Hannibal King (Ryan Reynolds) and the rest of the Night Stalkers. Both sides have ways to stop the other the vamps try to become day walkers by using Drake’s blood while the night stalkers want to create a virus that could take out the vampires forever. David S. Goyer directs and does an OK job if u believe reports of how Wesley Snipes was meant to have behaved thought out shooting. Ryan Reynolds and Triple H steal the movie with great supporting performances.